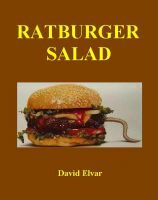 Ratburger Salad, by David Elvar, is not the kind of book I prefer. I like a powerful, dynamic main character, depth of emotion, metaphor, a setting so intrinsic you can feel it. Ratburger Salad has none of these things. But personal preference aside, let me tell you what this book is. Alex Bristow and his three best mates do NOT want merits in cookery class. It would ruin their whole image. So, with the help of a most unlikely comrade and a GIRL (heaven forbid!) they come up with the most cockamamie plan to thwart their teacher. I’ll let you find out for yourself if they succeed, but be prepared for chuckles the whole way. First, being American, I enjoyed the European flavor of words like “telly,” “merits,” “mum,” and “skive.” Words I don’t run across often outside of Harry Potter and old James Herriot tales. My favorite cultural discrepancy, however, was when the boys compliment a young lady (insincerely, of course)by saying she looks like a million pounds. (Think money, Yanks.) And this made her happy! Across the pond, you tell a girl she looks a million pounds and she’ll clock you right back into Europe! I have no argument with Mr. Elvar’s writing abilities. While his plot isn’t exactly jammed full of fast-paced action, he drives it along with masterful dialogue. And with colorful word choices like “bunging,” “sidling,” and–love this one–“ghastly.” His writing never dallies, never grows stagnant. Also, he treats us to a bit of tasty foreshadowing. We get the whole gamut of low class meets high class, girls against boys, brothers versus sisters, students against parents, and children in conflict with parents. He does a nice job of working out differences between the local fellows and the boy from the next school over and imparts a few moral lessons along the way. And with poignant irony, our four heroes dodge cookery class by implementing a plan that requires sewing! What really makes this story a winner, however, is Mr. Elvar’s ever-present wit. He makes very effective use of repetition to drive home his humor. Consider the following example: “One thing they had discovered long ago was the staff intelligence network. Another thing they had discovered long ago was a healthy respect for it.” The book is also smash full of droll one-liners like, “It’s a lousy job having a sister, but somebody’s got to do it.” And kids, in particular, will appreciate the creative nicknames the boys come up with for their less-than-appreciated teachers. Overall, even though it’s not my style, I’d have to say kudos, Mr. Elvar! Ratburger Salad is available at Smashwords.com.